Over 50% of the Bible consists of narrative. What do the biblical books of Genesis, Joshua, 1&2 Kings, Nehemiah, Matthew, John, and Acts all have in common? At the most basic level, they are all narratives––stories about God’s interactions with people. As every reader of the Bible is aware, many other biblical books fall into this same category. Indeed, narrative material composes more than half of the Bible. Even some books whose main genre is something other than narrative (e.g., prophetic books which contain large amounts of poetry), still contain narrative (e.g., Isaiah, Jeremiah, Ezekiel, and Hosea). This means that one of the major ways in which God decided to communicate with people is through the medium of story. Perhaps this is because everyone loves a good story, and because stories can be understood by people of all ages (although at different levels of meaning, depending on maturity). Because much of the Bible is presented in story form, this means that it contains all of the elements of a good story including: plot, characters, and a narrator’s voice. People often read the Bible without giving any thought to these, and other, ingredients of a good story. However, this article will attempt to show how paying careful attention to such details can provide a deeper understanding of biblical narrative. Specifically we will look at the critical role played by the narrator of a biblical text, and how identifying the biblical narrator’s voice can clarify a story, or even help prevent a misinterpretation. After discussing a few observations about the narrator in biblical stories, we will look at the story of Saul’s death related in 1 Samuel 31 and 2 Samuel 1. The two different versions of how Saul died has often confused people. Once we understand the role and function of the biblical narrator a solution to this problem will be more evident. In popular books, the narrator is often a device used by an author to tell a story. Therefore, the narrator and the author are usually two different people, unless it is clear that the author is telling the story in first person (I, we, me, etc.). Similarly, biblical narrative is usually told in the third person (he, she, they, or using a proper name such as “Moses said to God,” etc.). The Book of Nehemiah and the “we” sections of the Book of Acts are among the rare exceptions to this rule. 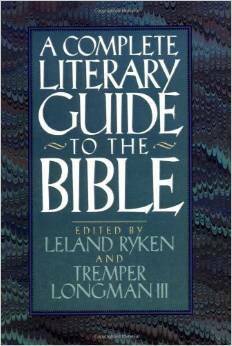 “The narrator is a device used by authors to shape and guide how the reader responds to the characters and events of the story.” It is important to note that the biblical narrator “gives the impression of an all-knowing mind…a mind that in the context of the canon must be associated with God himself” (Tremper Longman III, “Biblical Narrative,” A Complete Literary Guide to the Bible, p. 75). If the narrator’s point of view can be equated with God’s, then this means that statements by the narrator are always true. “Thus any statement made by the narrator about a character or event should be accepted as factual. If it stands in contradiction to a statement made by another character, then we can know that this character is lying, deceived, or misinformed” (see my discussion in Family Portraits, p. 9), or that the biblical author has some purpose in the apparent contradiction (see my article “How many sons did Absalom have?”). Understanding the role of the biblical narrator can be crucial for correctly interpreting a passage, and the story of Saul’s death in 1 Samuel 31 and 2 Samuel 1, provides us with an excellent opportunity to put this knowledge into practice. According to the biblical narrator in 1 Sam. 31, Saul took his own life. In 1 Samuel 31:1-5 we read of the death of Saul and his sons. Verse 3 informs us that Saul was wounded by the Philistine archers. In verse 4 Saul pleads with his armorbearer to kill him, but he is too afraid to strike Saul and so Saul falls on his own sword. Verse 5 reads, “And when his armorbearer saw that Saul was dead, he also fell on his sword, and died with him” (NKJV). Notice that verse 5 confirms Saul’s death in two ways. First, the armorbearer “saw that Saul was dead,” and second, the armorbearer killed himself the same way that Saul had and, therefore, “died with him” (my emphasis). Before looking at the description of Saul’s death in 2 Samuel 1, it is important to notice that the account of Saul’s death in 1 Samuel 31 is told by the biblical narrator. Based on our observations above about the narrator, this account should be viewed as a factual report of what happened. Indeed, there would be no reason to doubt it, if it were not for the fact that the story in 2 Samuel 1 seems to contradict it. 2 Samuel 1 rehearses the story of Saul’s death from David’s point of view. David has just returned from rescuing his wives and the families of his soldiers from the hands of the Amalekites (compare 1 Sam. 30 and 2 Sam. 1:1). David is in southern Judah in the town of Ziklag, which is a 3 day journey from the battlefield where Saul died (1 Sam. 30:1; 2 Sam. 1:2). A messenger comes to David to inform him that Israel has been defeated and Saul and Jonathan have been slain (2 Sam. 1:4). When David presses the messenger on how he can be sure that Saul and Jonathan are dead (1 Sam. 1:5), the young man relates the following story. He says that he was on Mount Gilboa and saw that Saul was badly wounded. It is what he relates next, however, that causes the reader to have what I refer to as a, “wait a minute” moment. Such a moment happens when what was previously read doesn’t seem to match the events of the current story. When the young man, who identifies himself as an Amalekite (2 Sam. 2:8), says that Saul asked him to kill him, we are reminded of Saul’s request of his armorbearer in 1 Samuel 31:4. When the Amalekite says that he complied with Saul’s request and killed him, we remember that Saul’s armorbearer had refused to do the same deed. These similarities are interesting and should cause a reader to compare the two accounts of Saul’s death. The real problem comes when we recall that the armorbearer had confirmed Saul’s death and then died beside him. Furthermore, the narrator never mentioned anything about an Amalekite being present at Saul’s death. On the other hand, the Amalekite has a pretty convincing story too because, he has Saul’s crown and bracelet in his possession (2 Sam. 1:10). Therefore, who should we believe, or could both accounts somehow be true? Some commentators, attempt to harmonize the two stories by combining them. They reason that maybe Saul wasn’t completely dead (inspite of what the narrator says! ), and that the Amalekite found him and finished him off. But this explanation has its own problems. For example, after stabbing himself, and his armorbearer believing he was dead (1 Sam. 31:5), did Saul really get back up off of the ground and lean on his spear (2 Sam. 1:6)? This would have to be the case for the Amalekite’s version to be accurate. Such details make the two stories difficult to harmonize. When a Bible-believer encounters what appears to be a contradiction in Scripture, the first impulse is to think of a rational explanation for it. Can the two passages be harmonized in some way? Can some other external circumstances explain away the contradiction? However, there are several problems with such attempts at harmonization. Forcing a harmonization can be like trying to fit a square block into a round hole. No matter how hard we try it doesn’t fit, but somehow we try to convince ourselves that it does! Second, whenever we consider “external circumstances” that are outside of the text, as a way of explaining the contradiction, we stop interpreting the text itself and enter the world of speculation. The world of speculation is a dangerous world because, by definition, it is something that cannot be proven. The problem with speculation is that one theory is as good as another. When we seek an explanation outside of the text, there are no longer any guidelines that confirm one explanation to be better than another. And let’s face it, sometimes speculation can lead to some bizarre explanations. However one might seek to defend speculation on a difficult passage, the biggest problem about trying to force an artificial harmonization is that we might be destroying the very thing that the biblical author intended! If the author intends for us to see a contradiction, then explaining it away will certainly lead to a wrong interpretation of the passage. 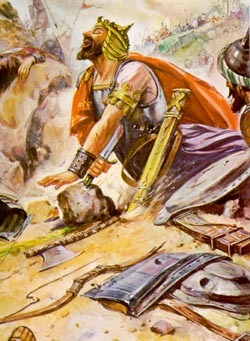 The Amalekite’s version of Saul’s death contradicts the biblical narrator’s version. Recognizing that each account of Saul’s death employs a different speaker is the real solution to the problem. Is there a contradiction? Yes there is, but it is a purposeful contradiction. We have already established that the biblical narrator relates the first account of Saul’s death in 1 Samuel 31, whereas, it is the Amalekite who speaks in 2 Samuel 1. Since we have agreed that the biblical narrator always tells the truth, and since it is obvious that the passages are contradictory, then the Amalekite must, in this instance, be lying. He cannot simply be misinformed or deceived because he holds Saul’s crown and bracelet in his hands. Therefore he knows that Saul was already dead when he came upon him on the battlefield. This conclusion is further confirmed by the biblical characterization of the Amalekites who are constantly portrayed as Israel’s enemies (e.g., Exod. 17:8-16; Deut. 25:17-19; Judg. 6:3). Moreover, Saul had previously been charged with destroying the Amalekites (1 Sam. 15:2-3) in order to fulfill what God had spoken about them in Exodus 17:14 and Deut. 25:17-19. In this same story, Samuel refers to the Amalekites as “sinners” (1 Sam. 15:18). It should also not be forgotten that David had just returned from slaughtering the Amalekites because they had burned his town and carried away all of the women and children (1 Sam. 30; 2 Sam. 1:1). Therefore, the wider biblical context, as well as the immediate context within the books of Samuel, consistently portrays the Amalekites as the enemies of Israel. The negative depiction of Amalekites in Scripture provides further evidence that the Amalekite lied to David and his men. This is additionally confirmed in 2 Samuel 4:10 where David refers back to this incident and claims the Amalekite was looking for a reward (NKJV). David’s exposure of the Amalekite’s motive further unmasks his lie. This conclusion also highlights the problem of attempting to harmonize the two accounts. Are we really to take the word of an Amalekite “sinner” and combine it with, or believe it instead of, the infallible biblical narrator? When all of this evidence is digested it becomes clear that it would be a grave mistake to harmonize the two accounts of Saul’s death. The biblical author has deliberately set two contradictory stories side by side (This is another indication that the contradiction is deliberate; the story of Saul’s death is still fresh on our minds when we hear the Amalekite’s version.). He uses the biblical narrator to present the real facts and follows it up with the contradictory story by the Amalekite. Why does the biblical author do it this way instead of simply telling us that the Amalekite was lying? First, it makes for a much more artful telling of the story. The reader must do some detective work to arrive at the correct conclusion. Second, the contradiction causes the reader to pause and reread both accounts. This not only encourages meditation on the two passages, but it makes the irony of an Amalekite reporting Saul’s death all the more delicious. 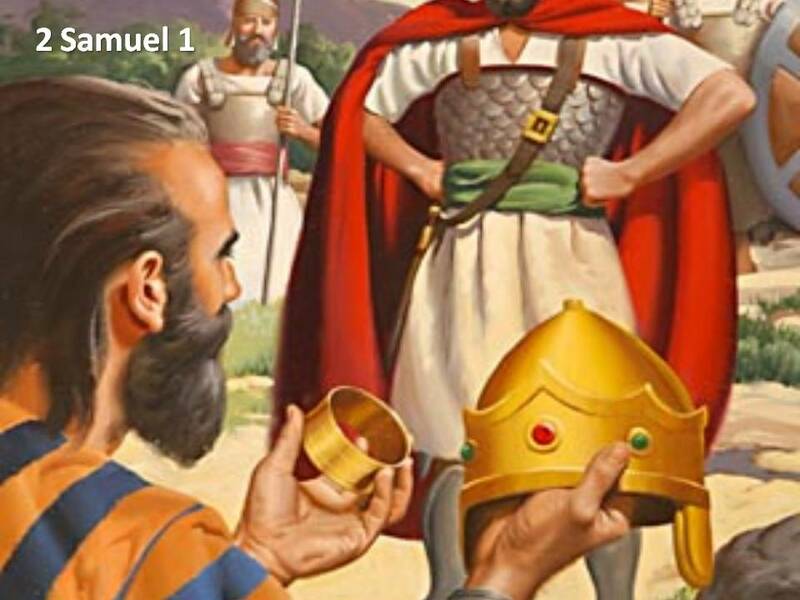 Third, it contributes to a common theme in the books of Samuel which can be referred to as “looks can be deceiving.” The Amalekite “appears” to have killed Saul, after all, he has his crown and bracelet. In this story the “looks can be deceiving” theme backfires on the Amalekite. His deception ends up costing him his own life. In conclusion, if we try to force these two passages to harmonize, we not only miss the art of the biblical author, we also miss the important messages he sought to convey. Therefore, we should be cautious about “solving” what appears to be a contradiction in the text before examining other possibilities. It may be that the biblical author has deliberately allowed a contradiction to occur in order to communicate a certain message. Thanks for clearing this up for me. I have always wondered who was telling the truth. Now I know. You’re welcome Helen. I’m glad it was helpful! Hey Randy, excellent post as always! 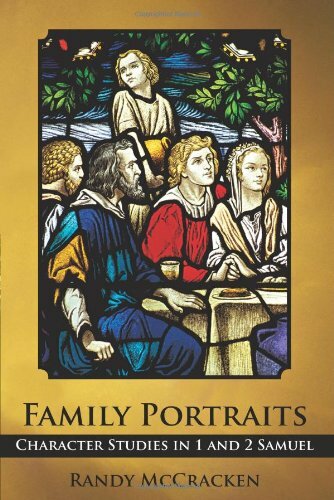 I remember reading in Family Portraits about the narrator always telling the truth and found that really helpful. See you soon. Thanks Lindsay. I look forward to seeing you soon as well. We’ll pray you guys have a safe trip. God bless!